Date & Time: August 28 - August 30 (Wed-Fri) from 9am - 4pm each day. 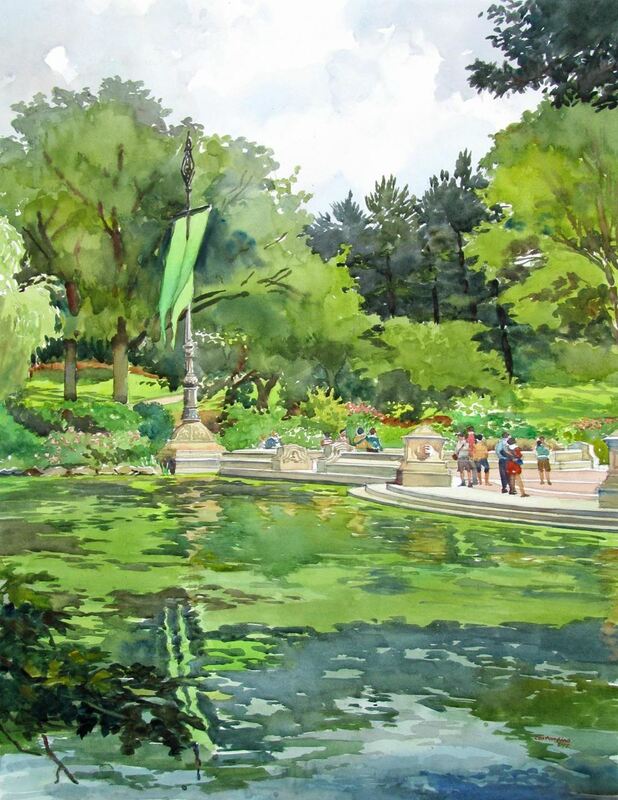 On Slater Park’s scenic grounds, and in the RI Watercolor Society facilities, Mr. Costantino will be offering an exciting plein-air watercolor workshop. This three-day session will expose students to the freshness and spontaneity of using the watercolor medium on site, and painting the wonderful scenes in the Park or adjacent areas. With daily demonstrations and theory, the instructor will explain the choices for subject and view selection, arranging a composition, color palette options, color mixing methods, and expressive brush techniques. He’ll explain wet-on-wet, glazing, blending, edge and dilution control, and other techniques – to help in capturing their own vision of their subjects. With individual review sessions & private demos during the painting day, each participant will learn ways to simplify subjects, while learning to see and achieve the dynamics of light, contrast, value, movement, space, texture, etc., which make paintings come alive. Experimentation will also be encouraged, to bring a heightened awareness of the many approaches for painting en plein-air. Relaxed group reviews will occur at the end of the day, with ample opportunities for unstructured painting time after class during longer daylight hours. Participant’s abilities should include basic drawing, a comfortable level of watercolor experience, and some painting experience on easels. Expectations are to have fun while learning. Frank is a signature member of the New England Watercolor Society, and elected member of the Salmagundi Club of New York, some of the oldest art societies in the United States, as well many other groups. He is a Co-Founder of the Plein Air Vermont Competition (PAVT), a nation-wide artists’ event. Frank has conducted numerous workshops and demos for students from all over the US. He is inspired by the effortless, masterful works of watercolorists from many eras and cultures - Sargent, Homer, Turner, Prendergast, Wyeth, Hiroshi, and Zorn - and has developed a versatile painting style from notable contemporaries. He has also been a selected artist and instructor to participate in plein-air events around the country. His work has been featured in Plein Air & Fine Art Connoisseur magazines, among others.